In 2009, the U.S. federal government effectively took over the student loan industry in the United States as one of President Barack Obama’s major initiatives. Seeing student loans as a way to boost the amount of revenue it collects from the low- and middle-income students who take out these loans to pay for higher education without imposing higher income tax rates on them, the U.S. government began directly funding student loans with money it borrows from the public. 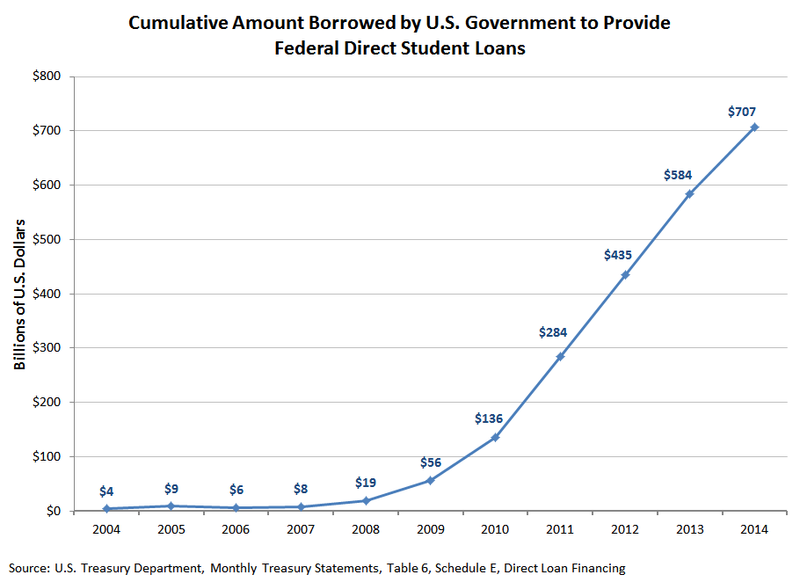 Since 2009, about $1 of every $10 dollars that the U.S. government has borrowed has gone to issue student loans. And because the federal government borrows that money at lower interest rates than it charges student loan recipients, it should be making quite a lot of money on its student loan racket. In obscure data tables buried deep in its 2016 budget proposal, the Obama administration revealed this week that its student loan program had a $21.8 billion shortfall last year, apparently the largest ever recorded for any government credit program. Politico goes on to describe the write-off as a “big quasi-bailout”—one that adds 5 percent to the size of the U.S. annual budget deficit. The negative revision has been made unavoidable because of actions President Obama has taken to provide generous “relief” to student loan borrowers whose incomes are not large enough to afford the full amount of their debt payments, by making their loan payments to the federal government’s student loan program directly proportional to their incomes. If that sounds more like how income taxes work than how debt works, that’s because the student loans in these cases have been effectively transformed into income taxes. But that transformation comes with a cost, since the deficient and delinquent student loans that are not being paid off in full means that the money the federal government borrowed to fund them will continue as a perpetual obligation for U.S. taxpayers. The only question is whether this $21.6 billion “adjustment” is a one-time cost, or the first of a stream of such adjustments. It’s not yet clear whether this will be a hefty one-time revision, or a harbinger of oceans of red ink as millions more borrowers get relief on their payments to the government. Several reports by Barclays Capital have warned that Obama’s generosity to borrowers could leave the student loan program as much as $250 billion in the hole over the next decade. And behind closed doors, officials in the White House budget office and the Treasury Department have criticized the Education Department’s loan models as overly optimistic, with some officials pushing internally for third-party audits. Perhaps the most effective way to resolve this issue would be simply to make all student loans fully dischargeable in bankruptcy proceedings once more, whether originated by private lenders or by the federal government. That way, the people who need real and permanent relief from their student debts, regardless of who their lender might be, could get it. 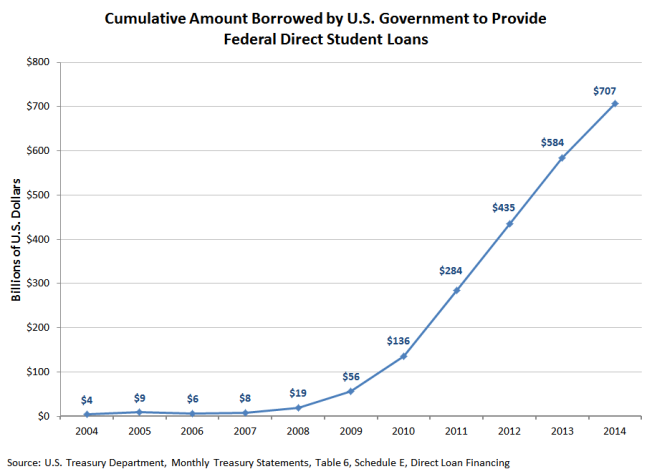 Faced with the risk of losing massive amounts of money because of the bad decisions it made in getting into the business of making direct student loans in the first place, the federal government might then have an adequate incentive to adopt a more fiscally sound approach to its direct lending racket by getting out of it. And that would go a very long way toward eliminating the federal government’s hidden budget deficit.